I seriously cannot believe it’s November. < I know I totally say that about every month, but I *really* cannot believe it’s November! I mean, when!? What happened? Because this holiday season is a whirlwind for most of us, this Rebel Favorites is going to be HUGE with a bonus gift giving guide as well! That way you can order your gifts ahead of time and save ’em until all your December holiday parties. I dunno about you, but this time of year I’m always looking for shortcuts! As always, please feel free to leave me links of things you’re loving this month, too! 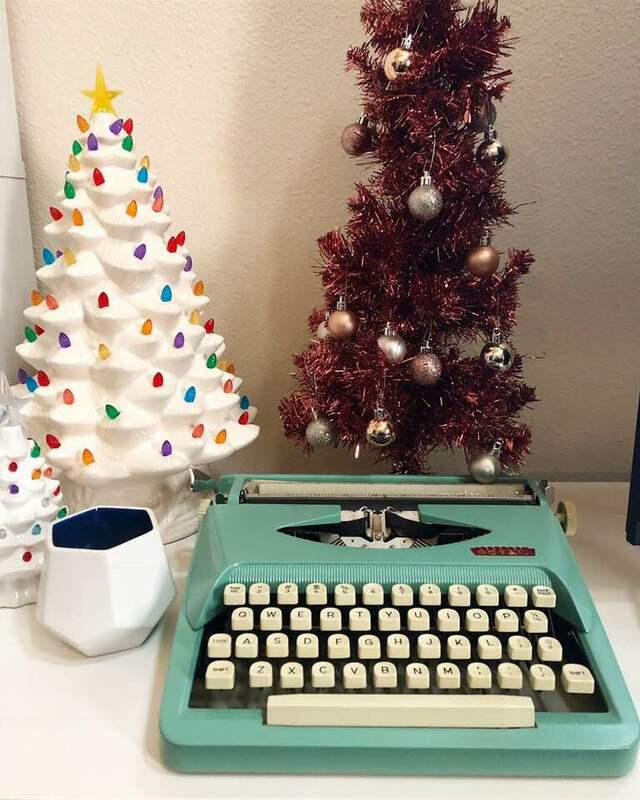 Love this mid-century inspired tree topper! It’s so smoky in California + the season for getting glammed up, so I love this to remove makeup, power my skin with antioxidants, and banish all the gunk in the atmosphere. Dying to try this to help combat the air pollution, too! I’m so sensitive because of my insomnia, so during my night showers I only use my go-to and have sweet slumbers. It only comes out this time of year, so I stock up! …but this one’s amazing, too! Spicy, warm + cozy goodness! My go-to drink recipe this time of year! I’m throwing a holiday party and am def going to use this guide to building the perfect appetizer! This jewelry set is precious and perfect for my astrological-loving self! As for books, I didn’t read as many this past month because I had a huge stack of magazines to plow through. But I am enjoying these thoughtful and complicated mix of short stories! Just picked these beauties up! Perfect size, and perfect symbol. Just discovered Mama Macabre on Etsy and love her stuff! I’m trying to be more eco-friendly, and her reusable pads, kitchen supplies and towels are amazing! Plus, I love supporting small business owners. Stopppppp! The earrings I am lusting after just landed on sale! How fun for the holidays!? And for my monthly “splurge” item: this gorgeousssss Brahmin bag! I own 2 and I love them so much. The pink color is to DIE! And now, let’s get to the gift guide! This guidebook to the modern hostess, written by my friend Courtney! Perfect for your hostess who loves to entertain in style. Agate is all the rage right now, and I guarantee your fave party planner won’t have this gorgeous cheese board! Adorable, practical and unique all in one: ideal for the host who loves to serve her guests! Smells like bubblegum and has plenty of instagrammable bath bomb art, I love this set for girls young and old. If she’s anything like me, she’s dying to know if her crush or BFF are compatible with her sign. This guidebook will tell her everything written in the stars! She can snap a #selfie in these funky but awesome face masks – no filter needed! Not only is this marble pastry slab gorgeous, it’s a practical tool in any baker’s kitchen. Marble keeps cooler than room temperature which is key for rolling out dough. The latest mixer to hit the market is this adorable retro-inspired version for Kitchen-Aid’s anniversary. Perfect for the collector! Everyone’s got a pressure cooker now… but the newest technology is the pressure cooker + steamer + air fryer combo by Ninja. This multi-cooker tool saves time and space and has so many cool functions, perfect for the technologically savvy foodie. This high-tech thermometer is all the rage right now – perfect for your fave grill master. A splurge, yes, but smoking meats are big on your favorite griller’s wish-list! This multi-cooker can braise, grill, smoke, roast, and even bake! A concave rubberwood cutting board is the ideal helper for carving your meats – juices stay in the center so there’s no mess. 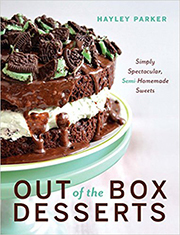 My latest book, Out of the Box Holiday Baking, hit shelves in October and is packed with 75 recipes, each with a full-color photo, and is loaded with amazing holiday recipes! 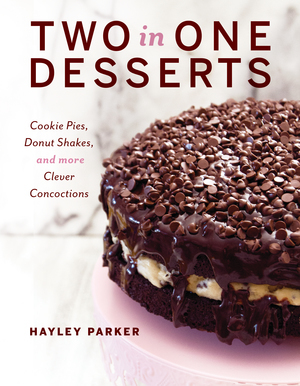 My dear friend Allison from Tornadough Alli just wrote her first book, Untraditional Desserts: 100 Classic Treats with a Twist and it is GORGEOUS. 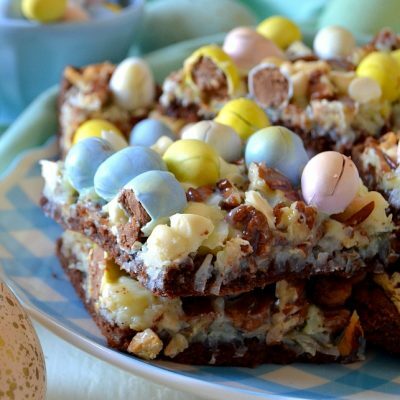 So many fun and unique recipes in there, from Shirley Temple Layer Cake to Fruity Pebble Churros. I’m in love! In Salt, Fat, Acid, Heat, you’ll learn the elements of cooking in this addictive and buzz-worthy new cookbook! Food bloggers everywhere are RAVING over this! Any one of these delectable flavors are guaranteed to please your finicky friend, and the vessel is just as gorgeous as the fragrance! (I particularly like Panjore Lychee and French Cade Lavender). My fave macaron shop delivers all over the US, and their unique flavors cannot be beat (hello, cookie dough and pecan pie!). Get a variety pack for your fickle pal, or send her some of their IG-worthy rainbow black & white cookies, all certified kosher and GF! This one-of-a-kind necklace is perfect for single ladies who like to get sh*t done without sacrificing style. Cute and stylish socks make for a great gift for your favorite teacher! Break up this gift set for 8 different (and deserving!) teachers or coworkers – the scents will conjure up happy memories during their winter break! Personalized stationary is a great tool for teachers since they’re constantly using paper products. Plus, it’s an old-fashioned gift that can be treasured in the digital world. This cool multi-tool has 14 functions in one (and comes with 2 of them – score!). Perfect for your fave handyman. A super popular game for 14+, this funny card game will have everyone in his crew laughing their butts off. A trio of cocktail-inspired candies to pair with his craft beverage selections. For the foodie: this everything bagel seasoning goes with, well, everything, and it’s super trendy in the food world right now. For the fashionista: these “crystal cupcakes” are not only gorgeous, but they’ll bright up any desk or bookshelf with their rainbow prism. For the resolution maker: a monthly horoscope book will help your optimistic friend navigate 2019 with sage advice from the stars. For the traveler: a genius mini-kit for any on-the-go pal who could use a hand in an emergency! For the student: I loved planners as a student in both high school and college, so this is my dream planner/calendar/sticker-holder. For the teacher: a stainless steel bottle (choose their fave pattern!) to hydrate during those 8-hour plus work days. Whether or not they fill it with wine is their prerogative. For the beauty guru: crystal rollers are all the rage because they feel amazing and help product get worked into your skin. This one’s pretty and practical! For everyone else: I love the idea of gifting these build-your-own gourmet candy box! Perfect for people who are picky, coworkers, neighbors, or last-minute gift ideas! Well, that’s it for now! 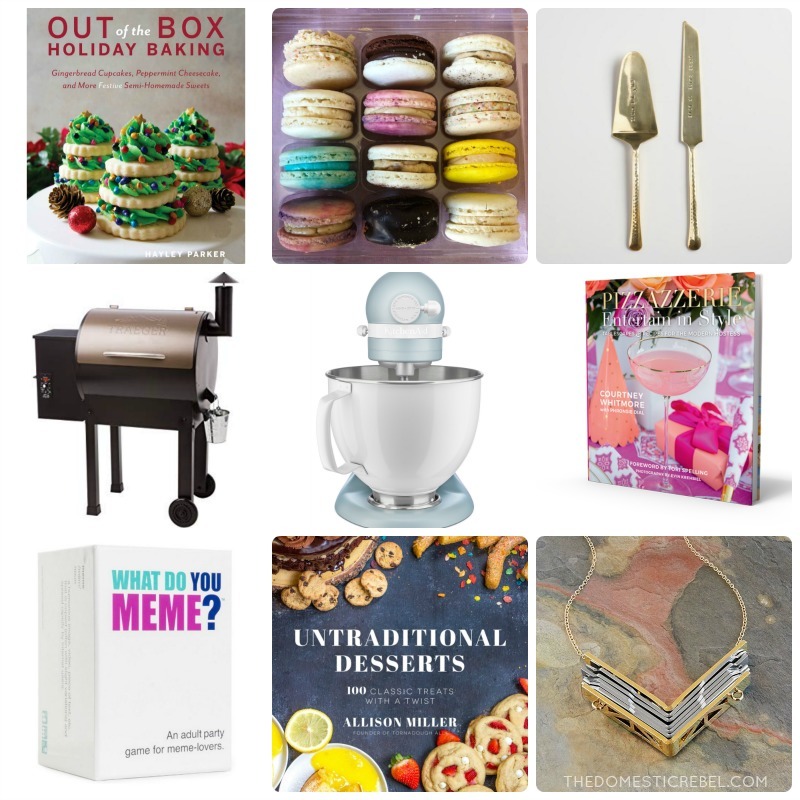 Hope you enjoyed the gift guide and I hope you find something new you’re going to love for someone you love! Disclaimer: this post contains Amazon affiliate links. If a purchase is made using my link, I will receive a small commission at no additional cost to you. Thank you for helping support my blog! Hi Shelly! Glad you love the ideas! 🙂 There’s some good ones for sure. I’m happy to sign those books for your friend – you know where I am!